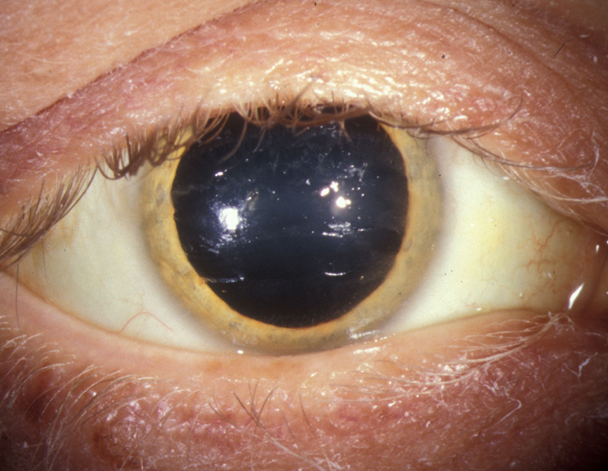 This rare autosomal recessive disease of young adults—characterized by abnormal copper metabolism—causes changes in the basal nuclei, cirrhosis of the liver, and corneal pigmentation called the Kayser–Fleischer ring. The ring appears as a green or brown band peripherally at the level of Descemet’s membrane and may only be visible with a slit lamp. The disease is progressive and often results in death by age 40. Treatment of the abnormal copper metabolism can result in sustained clinical improvement in some cases.